By Tessa Love in Green Matters. It’s no secret that solar energy has the potential to completely disrupt our reliance on fossil fuels and lead to a cleaner, more sustainable planet. But the design of the solar panels you see out in the world today come with a few problems: They’re big, they’re expensive, they’re not aesthetically pleasing and because for the most part they have to be stationary, they can only power homes and buildings. Luckily there is a lot of innovation in this area. The startup Build Solar is producing solar power units encased in glass blocks, which can be used like windows and seamlessly integrate into a building’s facade; Audi is working on solar panels that integrate into the roof of a car; and Tesla is creating panels that look just like the shingles on a roof. Now, in the latest innovation, researchers at Michigan State University have had a breakthrough in solar technology that has led to a completely transparent solar material, which could turn your windows—or even your smartphone—into energy-producing, emissions-cutting devices. The glass-like solar material is made with proprietary molecules developed by the MSU researchers. The molecules absorb invisible wavelengths of light but still allow visible light to pass through. This generates power via near-infrared and ultraviolet wavelengths while providing an unsuspecting window or screen. Indeed, the potential for these see-through panels to disrupt the solar space is massive. Electric cars will be able to implement them on their windows and sun roofs; mobile gadgets will be able to generate their own power via their own screens; urban buildings that are too tall to use normal solar panels can integrate them into their facades; even airplanes could potentially utilize this technology to generate power passively without even being noticed. 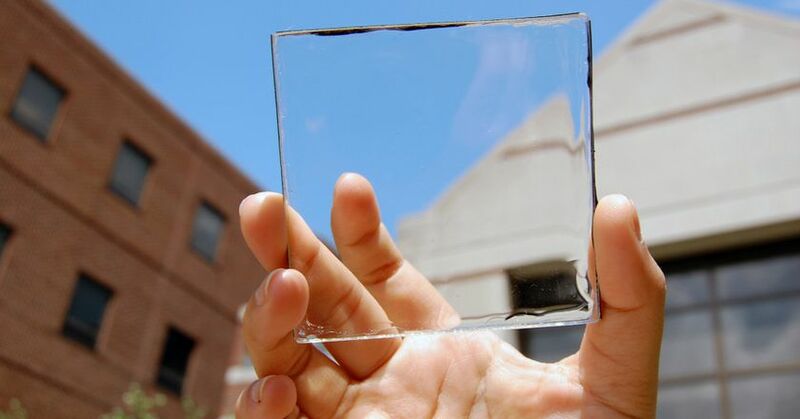 The highly transparent solar material will never be quite as efficient as their opaque counterparts. While they are recording efficiencies above 5 percent, traditional solar panels typically are about 15 percent to 18 percent efficient. Still, the transparent ones offer the potential to be applied to a lot more additional surface area, which could end up being even more disruptive than the opaque ones will ever be. The researchers estimate there is as much as 7 billion square meters of glass surface in the United States alone. If they can take over even a fraction of that surface area, our fossil fuel consumption could take a massive hit.